Like clockwork, Intel has allegedly once again made an official listing for a rumored series of next generation processors. Just yesterday we covered the potential of Intel’s first Cascade Lake series processors and shortly after Wccftech spotted a listing on Intel’s website for the very same chips. According to the listing – which has been taking down as of this writing – the upcoming Cascade Lake series falls under the Xeon server family, splitting into two Scalable and Advanced Processors meant for the High-Performance Computing and datacenter markets. 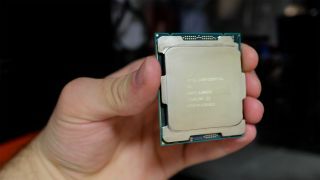 Despite the seemingly enterprise-focus of the Cascade Lake series CPUs, the Scalable Processor version will supposedly be compatible with the LGA 3647 socket, which opens up the possibility of a consumer facing Cascade Lake-X high-end desktop (HEDT) parts in the future. That said, we’ll likely see Intel upcoming Skylake-X or Kaby Lake-X processors enter the HEDT market first. Intel officially announced a 28-core processor at Computex 2018, followed quickly by rumors of a 22-core CPU.